I have started "production" on a silly experimental cutout style animation. This blog is actually part of the requirement for this specific uni project, but I plan to keep it going long after! 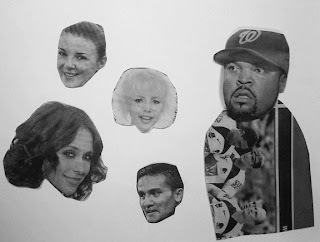 I've decided to use newspaper cut outs as it's a sure fire way to layer in some "depth" for little actual work, haha. Also I like the idea of modifying existing visual content into something a little more twisted, something this project will surely have. I'm making this from home so I've made myself a "ghetto-rigged" work station. 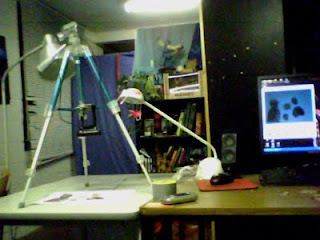 Masking taped a suspended webcam from a camera tripod, lighting it with some odd lamps. I've done a few software tests (I'm using a very simple free program) and have decided to shoot on 2's and have my storyboard v1 ready to go. Tomorrow I will try tackle the sets and characters and hopefully begin shooting! I'm not very confident this will turn out well as it's really new territory for me.